Gone are the days of ugly coffee-makers bringing down the tone of modern kitchens – Panasonic’s latest espresso machine – the NC-ZA1 – is a sleek, elegant newcomer, worthy of its own exhibition space in a futuristic gallery. 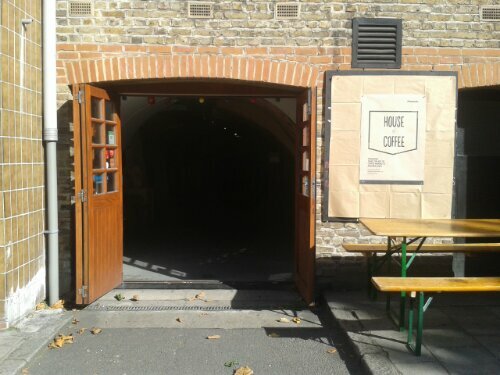 The sophisticated, silver-coloured, beans-to-cup machine was unveiled to bloggers at an exclusive, all day pop-up café, called House of Coffee, housed in ‘The Caves’ – a tunnel-shaped venue near Farringdon tube station. Stepping into the space, the first thing I noticed was a breathtaking series of images on the left-hand wall. 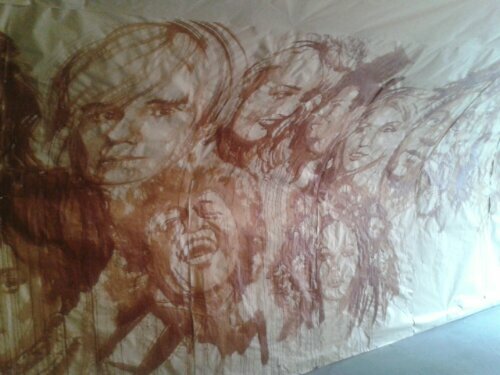 Sheets of parcel wrap were adorned with stunning retro portraits by artist Cosmo Sarson. 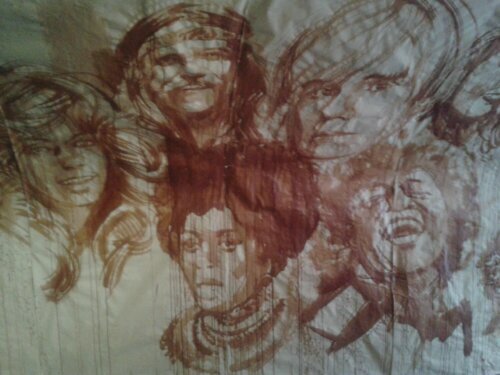 The disco-inspired images were all cleverly produced using coffee and were a fitting welcome to the ‘café’, which hosted a range of events throughout the day: breakfast, brunch, afternoon tea and a cocktail evening with a DJ set. Opting for the brunch slot, I arrived at midday to indulge in bagels, pastries and plenty of warm, soothing coffee – it was freezing outside, despite the appearance of the sun, and I needed to defrost quickly! 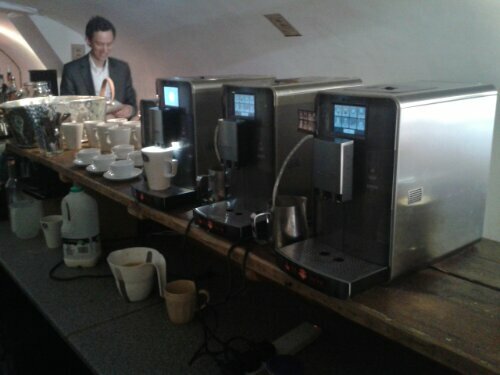 An impressive bar area was topped with three of Panasonic’s machines and, spoilt for choice, I started off my coffee binge by asking for a Latte: not too strong and generous in quantity, preferably served in a mug. 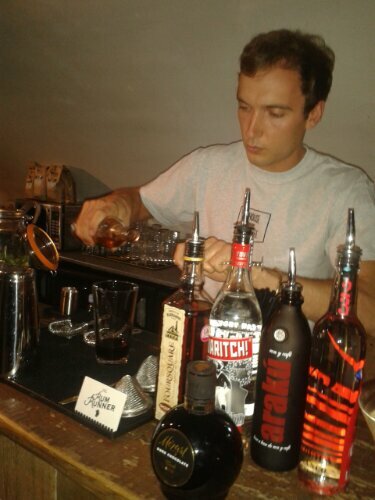 Invited to step behind the bar to witness my drink being made, the high-tech machine had no problem in catering to my picky request. Made with hand-roasted coffee beans by Union, and served in a stylish mug printed with Cosmo’s art, my Latte was creamy, smooth and perfectly delicious. Using the machine was simple: a touch-screen display offered Espresso, Cappuccino, Latte, Americano and Macchiato, after which further options included the desired strength of the drink and the volume – so if you fancy a super-strong double espresso or a big mug of weak Latte, you can have it within 60 seconds, all at the touch of a screen! 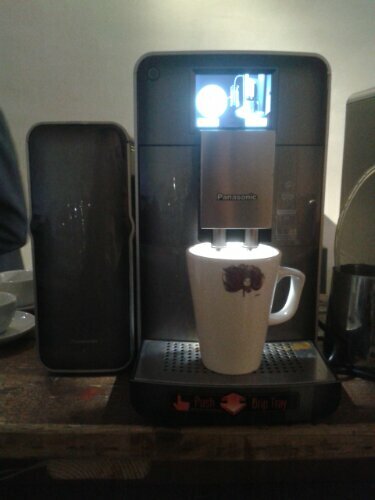 Expecting something far more complicated (which is often the case with state of the art machinery), I was surprised by the ease and speed of using the machine – so effortless, it will make even the biggest technophobe feel like a professional barista! 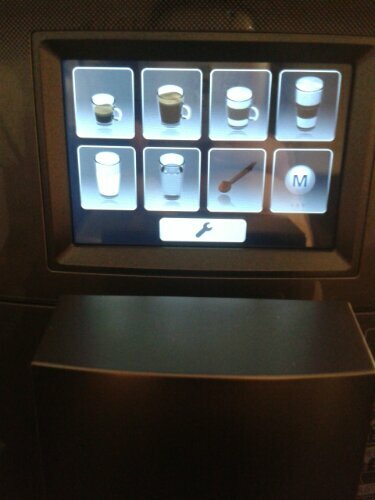 Coffee beans were poured into the top of the machine, which can also be fitted with an optional milk chiller – available to purchase separately for attachment to the side of the unit. Otherwise, it’s fine to use a simple jug of milk: the machine includes a handy tube to draw up the liquid without fuss. 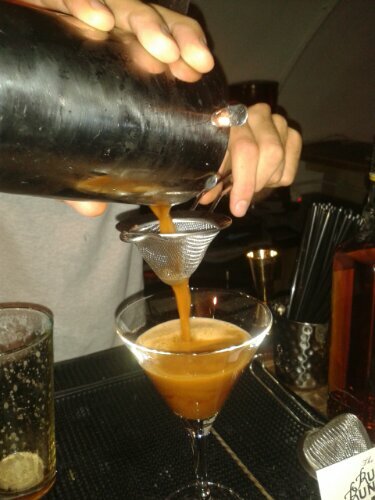 Proving that coffee isn’t just for teetotal-ers, there were three varieties of coffee-laced cocktails on offer – shaken and blended by The Rum Runner (acclaimed bartender Sam Paget-Steavenson, who also made all the hot drinks). Whilst I don’t usually partake in cocktails before evening, I couldn’t resist Sam’s menu and threw caution to the wind! 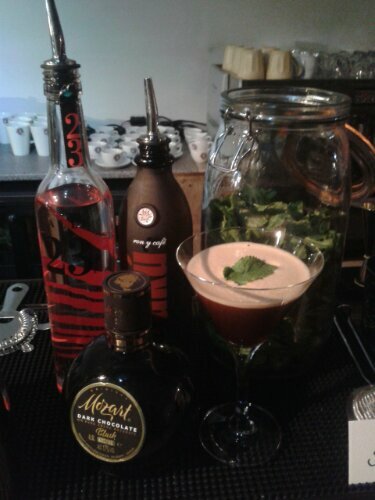 Opting for a Madrugada (Bianco Tequila with dark chocolate, fresh mint and espresso coffee, it was crisp and refreshing, despite an earthy undertone with a minty edge! 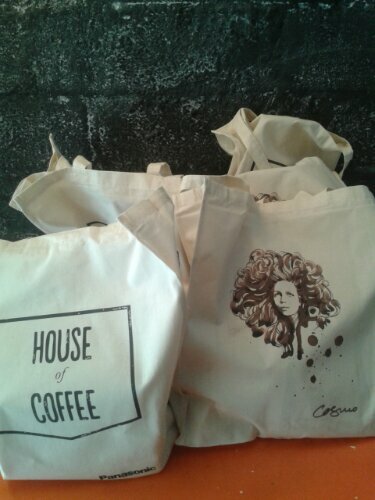 By the time I left House of Coffee, I felt super-charged and pleasantly light-headed! 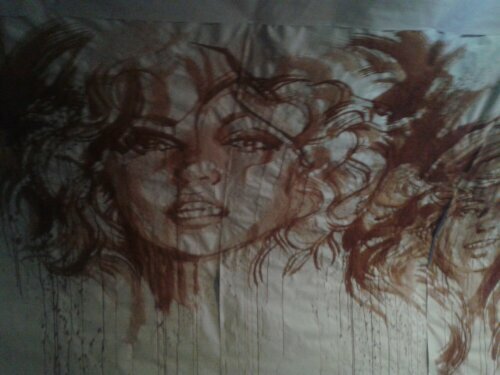 I was sent on my [merry] way with a gorgeous goody bag, containing a bag of Union’s hand-roasted Equinox Seasonal Blend and a fabulous espresso cup, decorated with a portrait by Cosmo Sarson – a lovely end to a lovely afternoon. The NC-ZA1 retails for around £899, with the optional milk attachment costing a further £69. 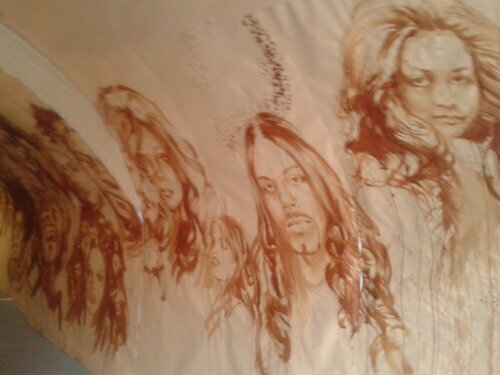 For regular coffee drinkers, it’s a great investment and worth the extravagance. Sadly, it’s a bit out of my price range, but would definitely be on my Crimbo ‘wish list’ if I had a wealthy boyfriend! There’s not much to criticise about the unit: it’s compact enough for a kitchen counter, smart enough to look elegant and it makes a damn fine cup of coffee! 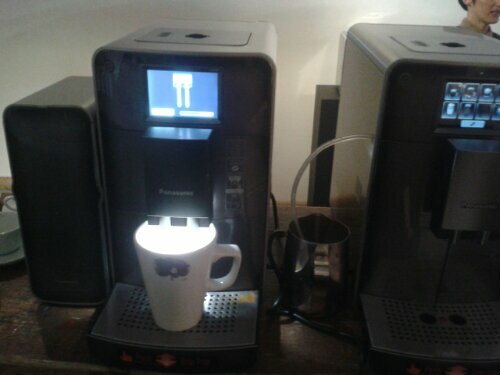 A great gadget and an undeniable must-have for coffee addicts. 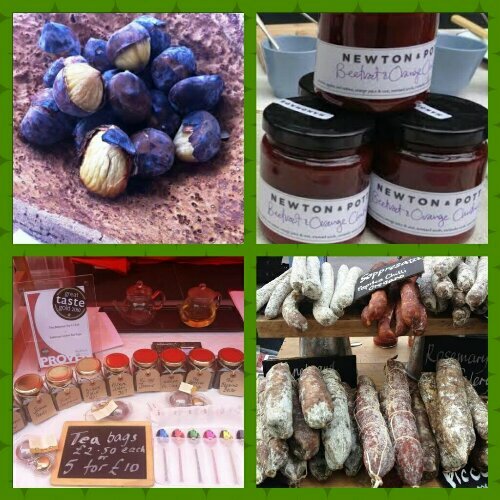 The bustle of Baker Street gets an extra injection of excitement on the second Wednesday of every month – a thriving Food Market offering everything from sandwiches to truffle oil. 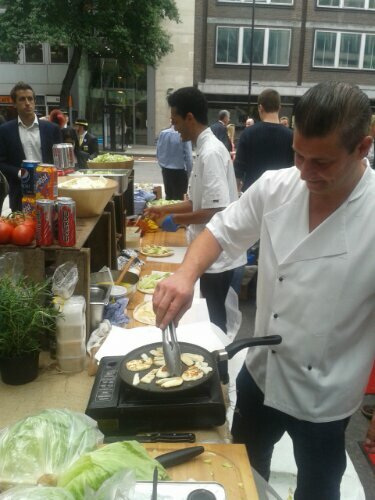 Greek Cypriot outfit Petros Produce dished up Grilled Halloumi Wraps (£5), a popular choice from a menu which also included Smoked Ham. Watching the thickly sliced cheese grilling slowly over a hot plate, it was easy to see why queues had formed! 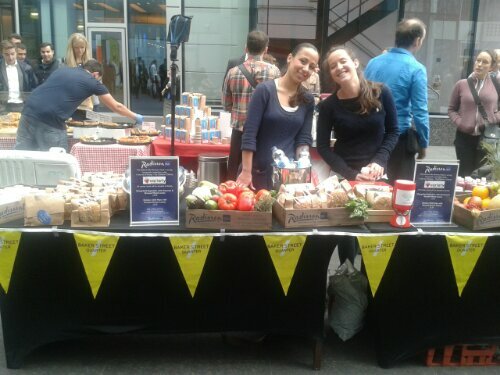 A fundraising meal-deal from The Radisson Blu Portman Hotel offered a homemade sandwich, a piece of fruit and a smoothie for £3.50 – with all money going to Variety, the children’s charity. Large, soft baps housed fillings of Chargrilled Vegetables & Hummus or Chicken Chilli Mayo & Rocket – both looked very tempting! 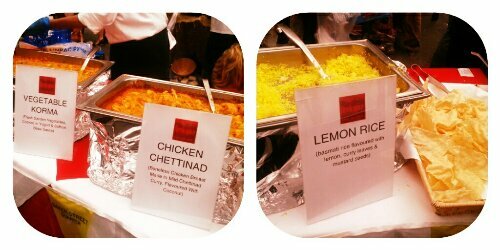 An array of vibrant-looking curries from Fire & Spice Bar & Kitchen attracted quite a crowd. The Marble Arch based restaurant dished up meat and veggie options of its signature dishes: Chicken Chettinad infused with coconut; Vegetable Korma made with yogurt and saffron; Lemon Rice; and Poppadoms. 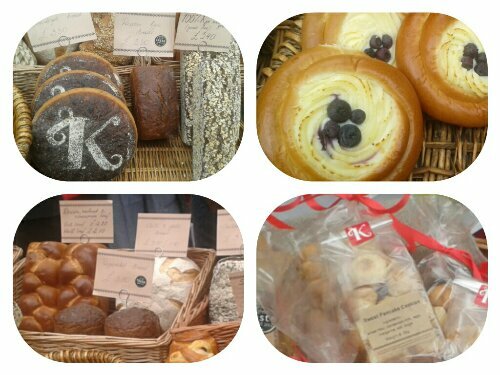 Samples of Karaway Bakery‘s beautiful breads and pastries all tasted superb – particularly a Lithuanian Scalded Rye and a Pumpernickel loaf. I brought home a bag of Pancake Biscuits, priced £1.20. The vanilla flavoured, bite-sized puffs have an airy texture and are exceedingly moreish! For something sweeter, visit Galeta‘s stall. The bakers are well known for their chewy, giant cookies and an award-winning, decadent chocolate brownie (£2). Giving the latter strong competition is their Pastéis de Nata (Portugese Custard Tart): layers of light, flaky pastry containing a scrumptious egg custard. 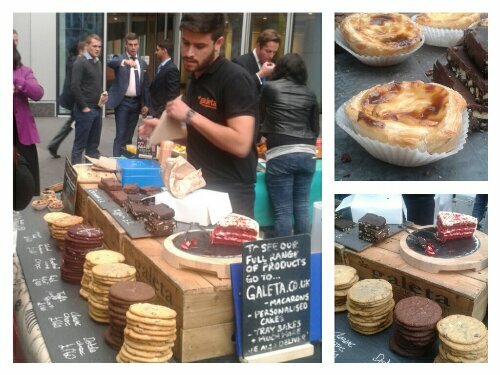 The tarts are priced at £1.50 each but it’s worth splurging £4 for four – restricting yourself to one could prove difficult! Hush Hush Chefs‘ filo pies and tarts also drew crowds. Crisp triangle pastries filled with Roasted Aubergine & Peppers and Mushroom & Cheese were huge, while open topped tarts, sliced into giant wedges, included Caramelised Onion & Parmesan and Roasted Vegetables & Goat’s Cheese. 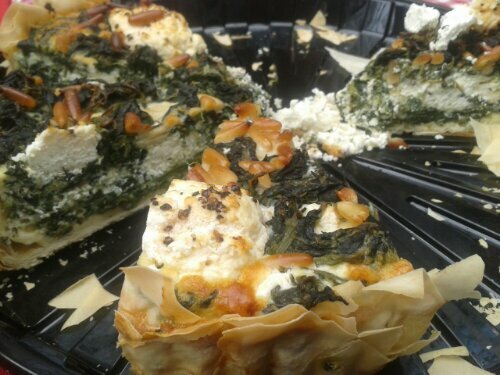 I opted for a slice of Spinach, Feta and Nut (£3.50) pictured above. The flavour and texture of the cheese seemed more akin to an unsalted Ricotta, but no-one else seemed to notice! Newcomer Marche Food was a great find at the market! Their delectable White Truffle Oil with Courgette was incredible, as was a sample of the oil served separately, Tartufo Bianco (£8) . 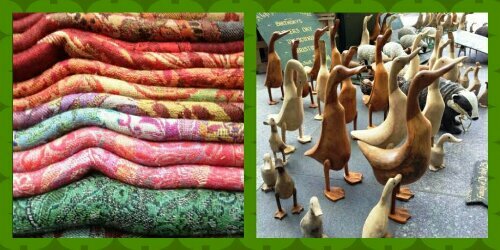 Selling products from Marche, Italy, a region renowned for its produce, the quality of the oils was exceptional, with a luxuriously rich flavour. 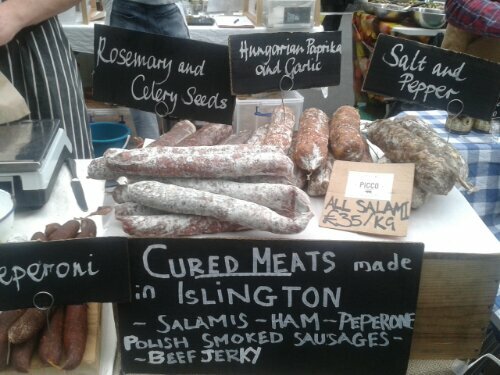 Flying the flag for charcuterie was Picco Salumi, an Islington based outfit famed for its cured meat products, made with the finest free range, British pork. I couldn’t resist buying three varieties of salami: Soppressata, made with garlic, chilli, oregano and hungarian paprika; Saucisson, spiced with ginger, garlic, ground white pepper, and whole black pepper corns; and Salt & Pepper with Mulled Wine – all delicious! 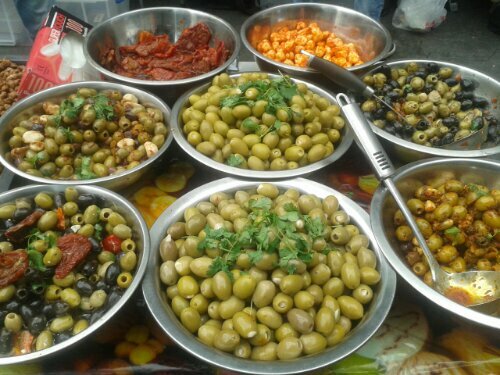 An enticing array of plump Olives, Nuts and Turkish Delight were also on offer from another vendor which I cannot name. Unfortunately, their branding still needs some work – the stall didn’t carry a sign with a company name – but their produce is great! 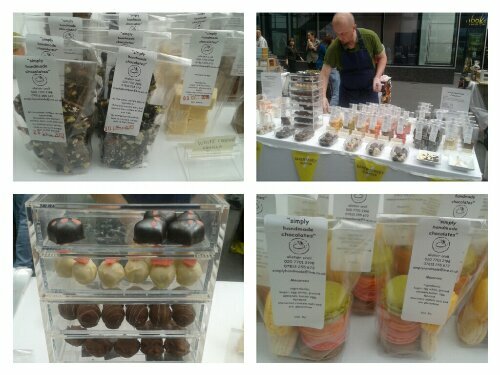 Simply Handmade Chocolates had a glorious assortment of truffles (from 95p), fudge (from £3.50) and macarons (£5 per bag) to choose from. I particularly enjoyed a smooth and intense dark chocolate Raspberry Fondant Heart and a creamy and crunchy milk chocolate Manuka Honeycombe Cluster. I’ll definitely be returning for some fudge and macarons very soon! 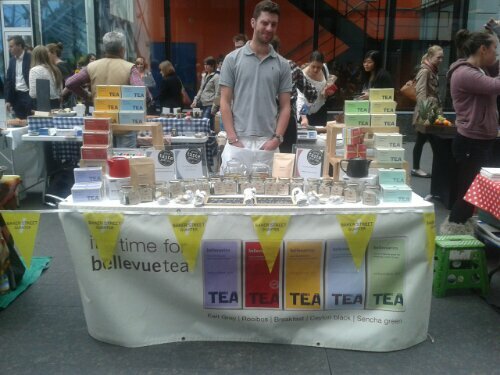 Bellevue Teas had a wonderful stall, with a fabulous selection of blends and gift sets. 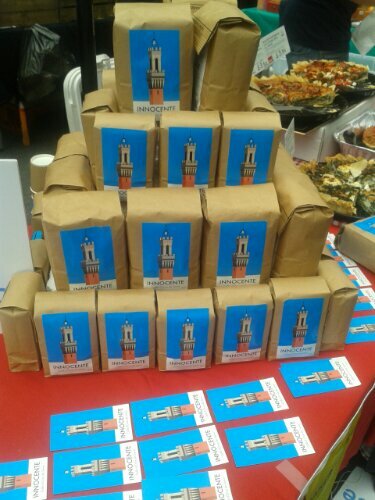 Both bags and loose leaf varieties were available to purchase, from classic Peppermint and Camomile to Nilgiri Silver Tip and Sweet Orange Rooibos. 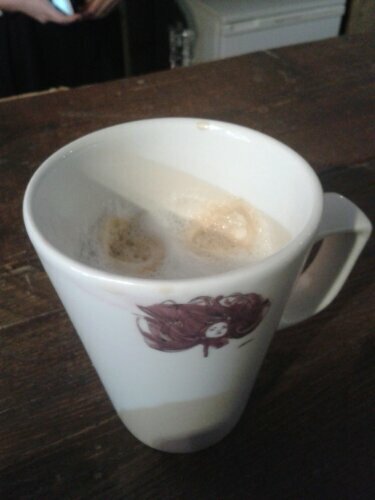 An unexpected, yet welcome, discovery came in the form of a smooth coffee that wasn’t actually made from coffee beans! Innocente‘s Caffè d’Orzo is a caffeine free alternative made from roasted barley and produced by a family-run business in Tuscany. Looking like espresso, it lacks the expected aroma yet tastes just like decaf – but without any of the nasty chemicals used in the manufacturing process! You can buy a cup for £1. 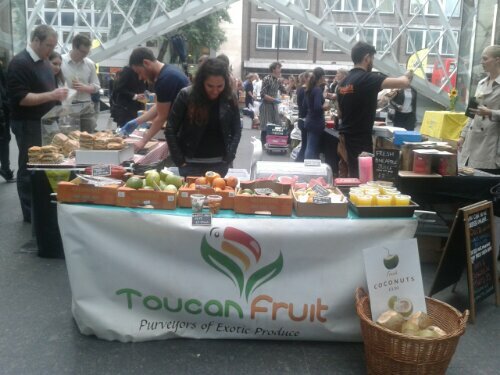 Toucan Fruit had the most colourful stall, showcasing exotic produce also available from their London store. I found a good mix of familiar and unusual fruits, from Coconuts and Melon to Cacao Fruit and Colombian Pitahaya. 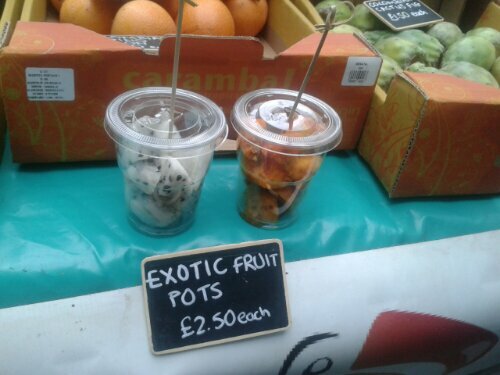 I recommend picking up an Exotic Fruit Pot – a healthy lunch or dessert option that will only set you back £2.50. Toucan also offered freshly squeezed juices: the only cold beverage available to buy at the market – great for washing down a hearty sandwich or chocolate treat! 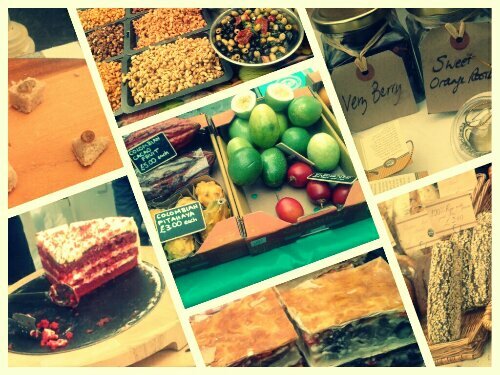 Baker Street Quarter Food Market, is held on the second Wednesday of every month, from midday to 4pm.